Twenty-year-old Nashwa Shaban is a senior studying economics at Albion College. Like many seniors, Shaban enjoys her major, loves to canoe down the Kalamazoo River and sometimes misses home. Unlike other seniors at Albion, Shaban can play the oud—a stringed, pear-shaped Arabic instrument. “It’s usually played by men, but the girls in Egypt are breaking through now!” Shaban said. Shaban is an exchange student from Cairo, Egypt. 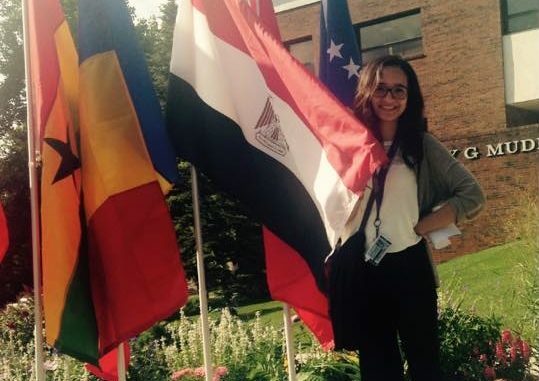 She studies at the American University in Cairo and is studying for one semester at Albion College. Her economics major and political science/anthropology double minor keep the senior busy. It was Shaban’s first time not only in the United States, but in any Western country. However, she quickly adjusted to the change. According to Shaban, Egyptian schools require English language courses. She studied English since kindergarten, and her strong language skills made the transition to the United States much easier. At first, Shaban thought she would have difficulty making friends. However, she found the people friendly and the atmosphere calm. She said she has met some of the best people in her life at Albion. Shaban’s professors at Albion left a positive impression on her as well. One professor, her advisor, knew that Shaban had dietary restrictions and bought her some food she could eat. Also, when Shaban wanted to take a vacation for a religious celebration, her professors were very accommodating. However, she found that many American students didn’t know much about the world outside of the United States. “Not many people I meet have knowledge of the Middle East or Africa or stuff like that,” she said. Shaban added that Albion has its highest number of international students this year, and students should take advantage of the opportunity to learn more about other countries by actually talking to people who come from outside the U.S. She said the international students would love to discuss their countries. When asked about her home country, Shaban quickly debunked some misconceptions. “It’s pretty modern over there, not like how people here stereotype Egypt. We actually have huge buildings and towers and stuff, and we don’t ride on camels to university!” she said with a laugh. The culture of Egypt and that of the United States differ dramatically. Shaban described how in Egypt, family is very important. University students go home to their families every day, even if they have to drive for hours. As a student of economics and political science, Shaban has an interest in the complex political state of her country. Shaban views the revolution in Egypt as one of the best things to happen for the youth of the country, but the outcome was extremely disappointing for them. However, Shaban said that things in Egypt aren’t as bad as the media portrays. Politics aside, Egypt is a beautiful place to live. Shaban described desert oases, coral reefs in the Red Sea, a white sand desert, museums, temples, Pharaonic monuments and of course, pyramids. “It’s magical,” she said. The weather in Egypt is also radically different from that of chilly Michigan. While Albion students enjoyed highs in the early 70’s during the past several weeks, Egyptians went about their daily lives in nearly 100 degree weather. Shaban has never seen snow before. Before coming to Albion, she also hadn’t seen forests very often. “Whenever I go to the forest, everyone makes fun of me because I’m taking pictures of it!” she said. After college, Shaban plans to continue into academia. She hopes to get her Masters and PhD in the United States and also do some on-the-ground research in Egypt on economic development. “I’m mainly interested in economic development, which I feel is the link between economics, anthropology and political science…if you are able to solve the economic problems in a country, I think that’s the most important thing you can do,” she explained. Shaban said that she misses her family a lot. She will return to Egypt in December and expressed bittersweet feelings about leaving Albion. “My heart is going to be divided into two places,” she said.